Microsoft is unveiling the Windows Phone 7 tomorrow in a press event and has also started promoting the device with ads in the media. 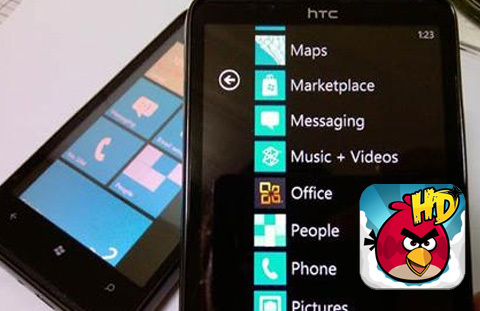 Users and tech blogs noted and reported about the popular iPhone game Angry Birds coming to Windows Phone 7 as its promotional images carried the Angry Birds icon. However the whole scenario changed when the developers of Angry Birds tweeted a denial of any connection or commitment with Microsoft to develop the game for Windows phone 7. It appears information was mistakenly posted to Microsoft’s website, and has been removed. Angry Birds is a massively popular iPhone game which made its debut on Android recently and Microsoft should also officially get the developers Rovio to create the app for its latest device. Users who are addicted to mobile gaming will obviously need some incentive to pay attention to yet another mobile phone and getting their favourite games and apps is the first step towards building a user base. Angry Birds has sold around 6.5 million copies worldwide which is a proof of its popularity. Rovio further stated that though they are not currently developing the game for WP7 but they’re open to do it if contacted through proper channels by Microsoft. We don’t like others using our [intellectual property] without asking. We could do a WP7 version of Angry Birds, not the issue. We have not agreed to do that (yet). Will support all relevant platforms. Said Rovio on their Twitter page.